The SSO agent can be directly started via the desktop link that is automatically created when it is installed. The login data correspond to the normal user data for the client. To log in, the desired database and the associated login data are firstly selected. The SSO agent makes all of the databases configured on the client available. It is also possible to create profiles as usual so that the connection data for certain databases can be used efficiently in the future. *The agent accesses the same configuration file as the client. All changes to profiles will thus also affect the client. New profiles can thus also be created via the SSO agent. After successfully logging in, the SSO Agent firstly runs in the background. Right click on the icon in the system tray to open the context menu. 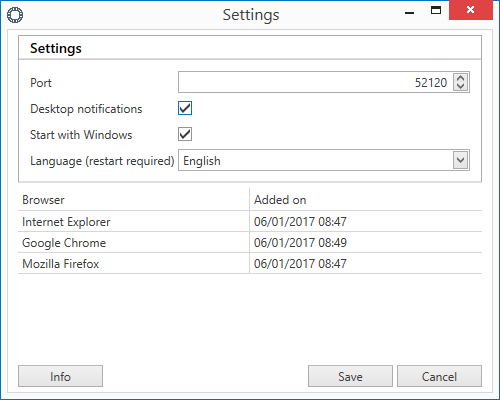 Install browser add-on starts the installation of the Google Chrome or Mozilla Firefox add-on. The port for connection to the database does not usually need to be changed. If it is otherwise occupied, it can be newly defined here. If the port is changed here, it must also be changed in the add-on. In terminal server operation, a range of ports can be defined via Terminal Server Ports which the terminal server will use for the connection. In this case, the default is 1000. Adjustments are usually not necessary. In terminal server operation, the so-called terminal server ID can also be retrieved. This is a unique ID that correctly identifies the agent on the add-on. The ID must be specified in the “add-on”:https://help.passwordsafe.de/v8/1/en/topic/addons when making the first connection. The SSO Agent firstly needs to be paired to the desired add-ons in order to start terminal server operation. Before pairing, ensure that the desired add-on is installed. The terminal server service must also be installed. This is installed together with the client. and the settings for the add-on will be displayed. Usually, the terminal server ID has already been entered here. You just need to confirm it. If it is necessary to change the port, you first need to log in to the SSO agent. The port can now be changed and saved in the settings. The SSO agent will then be ended. 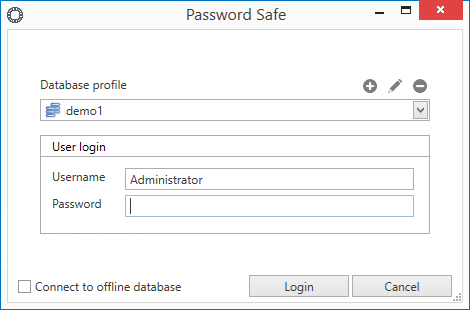 In order to accept the changes for the service, the Windows service Password Safe V8 Terminal SSO Service needs to be restarted. The SSO agent can now be restarted. The port will then also have been changed in the desired browser add-on. The SSO agent can also establish connections to offline databases. 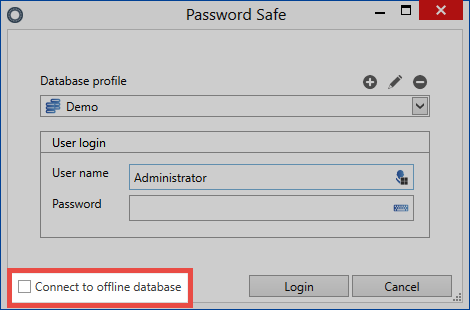 You can directly connect to the offline database, if one exists, at login. If there is no server connection, the connection to the offline database is directly suggested.